Hundreds of Kenyan's gathered at Uhuru (Freedom) Park and marched through City Center carrying 221 coffins to Parliament. The demonstrators were protesting Parliaments send-off package, which included a hefty retirement bonus, a state funeral and bodyguards. The coffins were burned in front of Parliament to signify the end of one era and the birth of another. The “mock funeral” was seen as an appropriate gesture as there is no more room for Kenyan's to bury their dead in Lang'ata Cemetery. 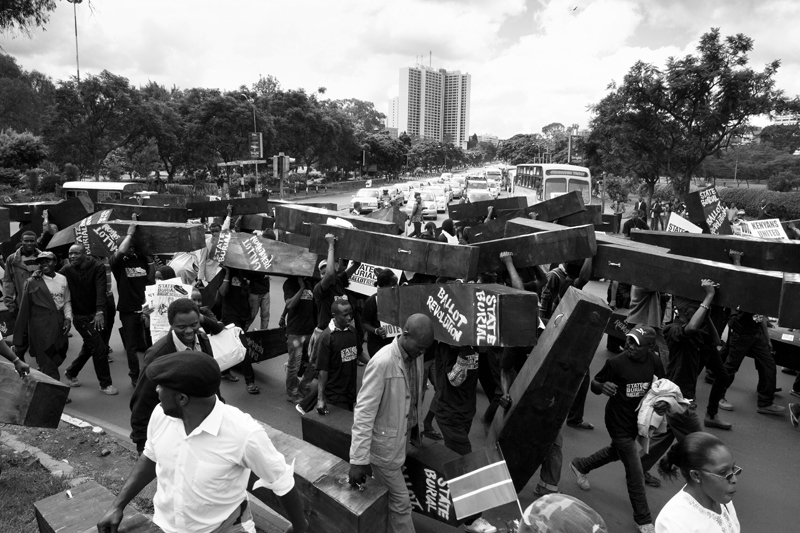 Peaceful protestors carried coffins reading, “state burial” and “ballot revolution” through Nairobi’s city center on January 16th, 2013.